Rental Costume includes: A full dress with train and long flowing sleeves in velvet and metallic brocade, trimmed in rich gold braid and simulated mink fur. This costume includes a matching hat and veil. It does not include jewelry. 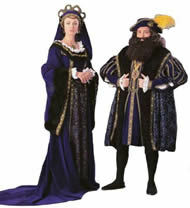 Rental Costume includes: An under robe in purple velvet with heavy gold embroidery, surcoat in metallic brocade, trimmed in gold braid and simulated mink fur. This costume includes a matching hat and tights.